Universities and colleges from across the UK and Ireland have shown how they are leading the path to efficiency, employability and creating a better future of life for us all. 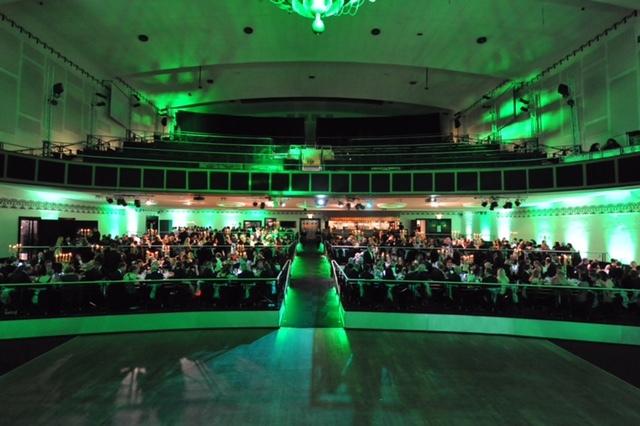 390 sustainability leaders gathered at The Athena, Leicester to hear Mike Barry, Director of Sustainable Business at Marks & Spencer, announce the winners of the 2016 Green Gown Awards. Celebrating the inspirational sustainability initiatives of 115 Finalists, representing over 1.5 million students and 243 thousand staff, the Awards Ceremony was the biggest yet with 21 Winners and 26 Highly Commended entries. This year’s Finalists show that initiatives of this kind can be a catalyst to help an institution achieve high quality student experiences, improve efficiency and access and provide students with invaluable employability skills. The value that tertiary education generates is huge and the Green Gown Awards both celebrate that value and drive its replication across the sector. View the list of 2016 winners and highly commended entries. PHE has just offered some new guidance on the use of e-cigarettes. Evacuation Chairs and Stair Climbers - giving you a choice to offer people who attend or visit your sites the opportunity to safely evacuate your buildings in an emergency or lift breakdown by having the correct equipment. It is not acceptable to expect the fire service to evacuate people from a refuge area, it is your responsibility. Building regulations recognise the need to have buildings that are accessible and user-friendly to all who may use them, including disabled people. The Equality Act ensures equality and access to buildings for disabled people within reason. The Regulatory Reform (Fire Safety) Order 2005 (RRO) makes the responsible person take account of the evacuation plans of everyone in a building, including disabled people. In 2007, the Government produced supplementary guidance to go with the suite of guidance documents already produced at that time for the RRO. ‘Means of Escape for Disabled People’. ‘The Fire and Rescue Service’s role in fire evacuation is that of ensuring that the means of escape in case of fire and associated fire safety measures provided for all people who may be in a building are both adequate and reasonable, taking into account the circumstances of each particular case. Under current fire safety legislation it is the responsibility of the person(s) having responsibility for the building to provide a fire safety risk assessment that includes an emergency evacuation plan for all people likely to be in the premises, including disabled people, and how that plan will be implemented. Such an evacuation plan should not rely upon the intervention of the Fire and Rescue Service to make it work. In the case of multi-occupancy buildings, responsibility may rest with a number of persons for each occupying organisation and with the owners of the building. It is important that they co-operate and co-ordinate evacuation plans with each other. This could present a particular problem in multi-occupancy buildings when the different escape plans and strategies need to be co-ordinated from a central point. What if the fire service is called elsewhere and can’t attend quickly, would you wait? Is it right that universities should have totally different views on what is acceptable in the evacuation of disabled people, as it is very clear from the above that you need to have the correct plans and equipment in place so that you can evacuate people with disabilities in a dignified manner? Don’t make a wheelchair user transfer from their wheelchair when the correct equipment will take them and their wheelchair up and down stairs. A wheelchair can take months to build and you want them to leave it in a burning building! Whose insurance covers that? The guide dog is a "mobility aid" that can enable people who are blind or have low vision to travel safely. Would you make a person leave their guide dog in an evacuation? If the answer is no then why leave a wheelchair? Is a university accessible when they can get people in but not out? This also applies to lift breakdowns. Evacuation and accessibility should be looked at together as they are linked and you can’t have one without the other. Swallow EMP's powered products enable access and egress on a daily basis as well as emergency. The largest range to cover different stairs, landings and people’s needs. We are not all the same! Consider fairly the means of escape for disabled people, don’t base it on cost. In an emergency situation, having adequate emergency lighting can be the difference between life and death. For example, a fire or a flood could easily cause a mains failure resulting in loss of normal illumination. Without adequate emergency lighting it may be difficult for occupants of the building to find a safe exit route which could ultimately lead to loss of life. A university campus presents an environment with many and varied risks; for example, kitchens, science labs, sports facilities, lecture theatres and student accommodation, and so in the first instance it is important to ensure that risk assessments are carried out to identify and manage potential hazards appropriately. On top of this, universities hold an extremely large number of staff and students who would need to be evacuated safely and efficiently in case of an emergency, therefore having well-managed emergency evacuation systems and procedures is essential for ensuring the safety of all occupants. For example; in October last year, a fire broke out in Bristol University’s student accommodation in Colston Street. The fire quickly spread throughout the block of flats and the local Fire Station Manager said that it was both the presence of fire alarms and a well-managed fire evacuation plan that allowed the 120 students to evacuate safely that day (Bristol Post, 2015). Universities have a duty of care towards their staff and students and a legal obligation to ensure that life safety systems remain compliant with legislation. The British Standard for Emergency Lighting, BS5266, should be used as a guide for installing and maintaining emergency lighting systems to ensure compliance with legal requirements. For Universities in England and Wales, the Regulatory Reform (Fire Safety) Order 2005 is also applicable and article 14 states that ‘emergency routes and exits requiring illumination must be provided with emergency lighting of adequate intensity in the case of failure of their normal lighting’. Universities in Scotland should refer to the Fire Safety (Scotland) Regulations 2006. Failure to comply with legislation could lead to prosecution. This article was written by Hochiki Europe; a leader in fire detection and emergency lighting systems. For product information, or to request a copy of Hochiki’s BS 5266 pocket guide, please visit www.hochikieurope.com. Alternatively, please visit Hochiki on their exhibition stand at the USHA Fire Group Seminar between 7th and 8th June. Enshrined as a place where ideas could develop independently from any other power, ‘academic freedom’ has been a defining feature of universities since the establishment of the University of Bologna in 1088. Higher education institutions provide a safe space for free speech, for debate and for challenging the status quo. It is into this environment that the Prevent Duty has been introduced by the UK government just recently, to respond to the ideological challenges and threats that modern terrorism poses, and to prevent people from being drawn into terrorism. To some, the Duty is highly controversial, seen as a threat to the academic freedom so important within the sector. But whatever your views, compliance with the duty is a statutory requirement to which all UK universities must now adhere. As part of the UK government’s overall strategy on counter-terrorism, section 26 (1) of the Counter Terrorism and Security Act 2015 outlines the responsibilities of ‘specific authorities’ to have ‘due regard to the need to prevent people from being drawn into terrorism’. Higher education institutions are classified as ‘specific authorities’ and must now comply with both the general and sector-related guidelines. • ensure staff implement the duty effectively. What should higher education institutions do? Specific guidance has been developed to help universities and HE colleges to comply with the Duty, for England and Wales and for Scotland. The focus is on developing policies and procedures that ensure a balance between freedom of speech and a ‘due regard’ for students, staff and visitors. 2. Senior leaders must be actively engaged with the Prevent Duty. This means they must ensure that internal mechanisms are in place to share information within the institution. They must also work in partnership with relevant external partners, including the Police. In Scotland, there is an additional requirement to participate in the Scottish HE Prevent Network; in England and Wales, contact must be maintained with the Safe Campus Communities. 3. HE institutions must have implementation plans in place, which fit broader multi-agency action plans. 4. All staff must be aware of the Prevent Duty, so staff training opportunities must be available. Awareness must extend to the institution’s relationship with its Student Association and their clubs and societies. 5. The institution must develop policies for safety online, with specific reference to the Prevent Duty. 6. Facilities to enable different faiths to worship on campus must also be provided, to support the welfare and pastoral care of students and staff. For England and Wales, there is an additional focus on maintaining a formal risk assessment for student welfare and for the physical campus estate. If you are a governor or senior manager at a university of HE college in England, Wales or Scotland, then you must ensure that your institution is compliant with the Prevent Duty. If not, the UK Government can take further action, which may be equivalent to a court order. Become a champion for your institution’s implementation and approach to the Prevent Duty. In large institutions like universities introduction of appropriate eLearning course would be the probably the best option as it’s a scalable solution. Remember the audit trail in case you need to proof the compliance. If you are a member of staff at an HE institution or at a students’ union or association, then you should take the time to educate yourself on the Prevent Duty and how your institution is implementing their responsibilities. Be proactive and find out what your specific role demands. The UK government has developed guidance on the Prevent Duty, for all specified authorities and for providers of higher education. HEFCE has additional information for institutions in England, and good practice guidance has been developed for those in Scotland. Other bodies have also developed information, including Safe Campus Communities and the Committee of University Chairs. EssentialSkillz also supply an online training course aimed at educating staff on their duties and responsibilities around Prevent Duty. The introduction of the Regulatory Reform Fire Safety Order 2005 & The Equality Act 2010 requires that employers or organisations providing services to the public, take responsibility for all people, including disabled people evacuating buildings safely. When an employer or a service provider does not make provisions for the safe evacuation of disabled people from its premises, this may be viewed as discrimination. It is a general requirement that emergency procedures are preplanned and that planning should have regard to the needs of all occupants. It is therefore essential to identify the needs of disabled people and, where necessary, to make proper arrangements for their assistance in the event of an emergency evacuation. Universities should encourage disabled staff and students to make themselves known. This is to enable their safety during an emergency procedure is given the highest priority. This declaration should be encouraged at registration for students and final interview stage for staff. This is especially important in situations where there is sleeping arrangements e.g. halls of residence. The fire risk assessment process makes it quite clear that any change in risk to life from fire should be reflected with appropriate measures taken to offset any risks identified. Allowing disabled persons into the building by means of lifts or other powered systems without providing for suitable means of egress is increasing the life risk, quite possibly to an unacceptable level. The Fire Service is not responsible for the evacuation of anyone, even the disabled - it is the employer’s duty. The Fire Service has a duty to rescue people. The term “rescue” infers that someone must be in a life-threatening situation requiring the immediate intervention by the fire brigade. A differently able or mobility impaired person positioned in a refuge, for example, isn’t someone whom requires rescue, they are certainly not in a life threatening situation, unless of course somehow the fire has spread into the refuge area which would be extremely rare. However the employer should have in place suitable procedures to safely evacuate this person from the refuge in an emergency situation. So therefore, if access is given to areas within the property then clearly egress arrangements must also be put in place to ensure the safe evacuation of disabled persons from the property. As we cannot use the lift for the purpose of fire evacuation, we must utilize the stairway. In order to protect staff, pupils and others during the evacuation, it is required that a fire protected stairway is used. This stairway will be enclosed with fire resisting construction and will lead directly to a final exit, but in many circumstances this causes a problem for the mobility impaired, how will they negotiate the stairs in an emergency situation? The best solution is an evacuation chair, and the Evac+Chair, the world’s number one supplier of evacuation chairs provide a range of universal solutions for smooth stairway descent in an emergency evacuation, suitable for dual and multiple level buildings of any height. *An Independent study conducted at Ghent University Hospital by trained staff to evacuate people with mobility issues down 11 floors. The Evac+Chair was the fastest in horizontal evacuation at 1.5m/s and in vertical movement the evacuation chair was also fastest averaging 0.83m/s. The study highlighted the Evac+Chair as the only device that required no stopping by the operator as fatigue did not affect the operator. The Evac+Chair also performed best in the area of not blocking the stair as it only covers one lane and the fact it only requires one person to operate, with very minimal difference in speed of evacuation when using the Evac+Chair if the operator is male or female. The study concluded the Evac+Chair is the best and only option to evacuate people down stairs with mobility issues, it is the fastest, easiest, least blocking, any gender can operate and only requires a single person to operate unlike any other evacuation method. View all Hasnet Discussion Groups here. The most prolific users are the networking groups in the Midlands and Wales as well as the Fire, Radiology, Biological and Estates Groups. The USHA estates group is developing momentum within Higher Education Institutions and starting to build effective collaborations and partnership with key stakeholders. March 2016 saw the third USHA Estates seminar held at the University of Liverpool in London. The theme, health in construction, echoed the sentiments of the construction 2025 strategy further emphasised by the HSE principal Construction Division: Health Risk Management Unit who irritate to the cohort the HSE strategy which aims to operate an industry with considerably safer and healthier conditions. To give some practical application Imperial College London presented a case study that illustrated a cross-industry and organisational leadership model that has driven continuous improvement of health and safety culture within the construction industry. A model based around the Olympic Park project involving effective partnerships and most importantly from the case study clients commitments to safety and health which are signed up to by contractors at the start of the construction journey. The group has made in roads to work in closer collaboration with the Association of University Director of Estates (AUDE) and the Association of University Engineers (AUE); with the Chair of AUDE opening up the annual seminar. This venture has opened up discussion to develop annual safety newsletters informing Directors of change and promoting the work of the group, an opportunity to deliver workshops, seminars and facilitate discussion and debate with Directors and AUDE members. Furthermore a health and safety section within the AUDE website, with the feasibility of the Estates Group owning this section of their website enabling the group to influence and promote activity. Specifically with the AUE initial discussions have taken to place as to how the two associations can develop a closer relationship; an area of interest across all three associations being statutory compliance. 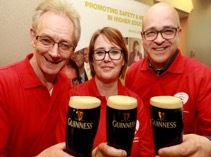 At a national level a strong partnership is being forged with the HSE and Construction Clients Groups in the development of the client’s commitments initiative; an initiative the group intend to focus on, promote and develop with our partnering associations. More specifically the CDM15 sub-group has completed sector specific guidance, models, training packages, information for the implementation, management and compliance of CDM15 which has been shared via AUDE. The compliance sub-group is beginning to working in partnership with the AUE focusing on the development of a reference/guidance document that will provide an audit framework to establish compliance; minimum statutory compliance, industry best practice and excellence. The asbestos sub-group is developing guidance for the management of asbestos in soils a HSE initiative; also considering the impact of the proposed changes to the asbestos analytical guidance. A programme of asbestos awareness roadshows is being planned across the UK. Exciting times are ahead for the group as we continue to build a platform and create opportunities to really impact and influence changes in health and safety performance in conjunction with members AUDE and AUE and the wider University community. 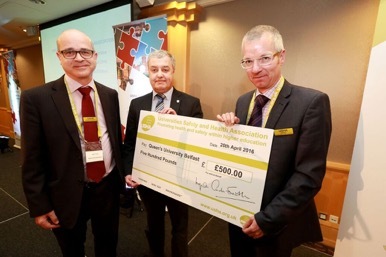 I would like this opportunity to thank all those members who have given their time to build the group and continue to support the groups’ initiative as we strive to improve the health and safety culture within Higher Education Institutions. The conference was attended by over 50 members of the UBMA who had an opportunity to quiz Clive not only on the latest guidance but the revision of HASMAP and also the changes in sentencing guidelines for health and safety offences. On a personal note Clive said that conferences and seminars such as the UBMA are an excellent opportunity for USHA members to engage with colleagues from other disciplines so as to keep them up to date on health and safety matters. The Hasmap standard was recently discussed at the HESH forum and the UCEA Health and Safety Committee which was attended by the Trade Unions and an offer was extended to them by USHA Chair Gary Wood to attend the Hasmap training sessions run earlier this year by USHA in Coventry, Leeds, Greenwich and Uxbridge. In the end the USHA Auditing Group felt this was not the best way of engaging the TU with Hasmap so offered a bespoke workshop training session. This was made to UCU, Unite and Unison and was taken up by UCU. UCU provided its Birmingham branch office training facility and covered all costs. 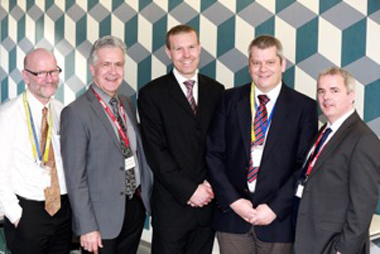 Coventry University supported the USHA Auditing Chair Scott Trim who gave his time to run the training for free. The training covered the principles and background to Hasmap, the Leadership and Management guidance as well as methodology for working closely with Health and Safety Directors and Heads, the whole day was enjoyed by all and positive feedback was received. How do Principal Investigators view their role as safety leaders? What leadership practices do Principal Investigators use to drive safety? How can Principal Investigators’ engagement in safety leadership be strengthened? These questions are being explored by a research project on Principal Investigator (PI) Safety Leadership at The University of Manchester. Dr Sara Guediri from Alliance Manchester Business School presented some early findings from the study at the launch of the USHA Leadership & Management Guidance. Results from interviews with PIs highlighted the importance of informal development (learning PI leadership through experience) and identified several leadership tactics to improve safety. This poster provides a quick overview of the main outcomes from the interviews. The project is now in its second phase. Dr Sara Guediri, Dr Patrick Seechurn and Rachel Valentine (Chair of USHA’s Competency, Development and Training Group) are leading a survey study to include responses from a larger sample of PIs from UK Universities. 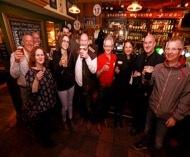 This year’s conference hosted by Queens University in Belfast saw 47 Institutions attending including our newest Galway Mayo Institute of Technology who joined as Associates in February. 2 Institutions were back after a two year gap South Wales and Ulster - who were back in force sending 5 delegates each. USHA would like to thank Queens Health and Safety Manager Robin Butler and his team for all their support and hospitality at the event. The highlight for many was being entertained by the TV celebrity and mentalist David Meade..just ask Pete Adams at Bristol or Scott Trim at Coventry what they endured!